Published on 9 May 2012. 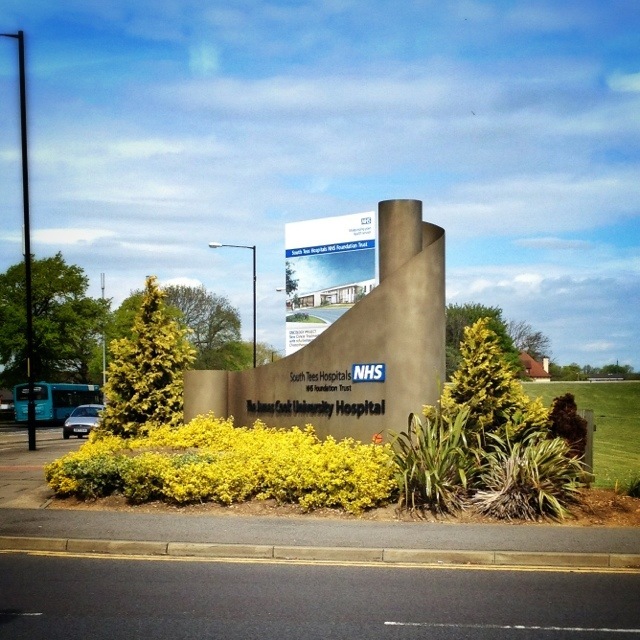 I was back at the James Cook University Hospital for a meeting this morning – I previously featured it on 4th April. I hadn’t ever really noticed until today how pretty the signs outside are. They’re a bit overshadowed by the massive lettering on a nearby fence. I was going to make a sarcastic comment about the hospital’s “expresso bar”, but it turns out that expresso is, in fact, merely the Spanish to Italian’s espresso. There are, it seems, quite a few expresso bars. So I learned something new there! This 1,641st post was filed under: Health, Photo-a-day 2012, James Cook, Middlesbrough.